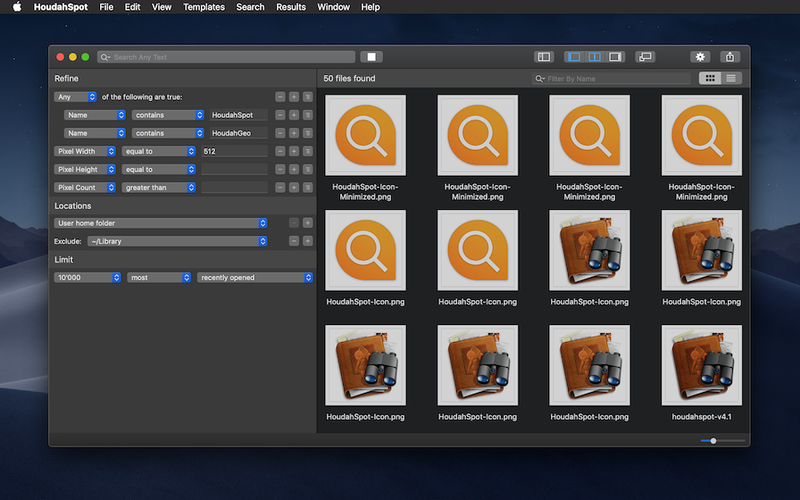 HoudahSpot – Powerful File Search for Mac. Locate hard-to-find files and keep frequently used files within reach. Searching by file size can be very useful – not only to find and clean out large files, but also to limit search results to files large enough to be relevant. When you add a new file size criterion to your HoudahSpot search, it defaults to searching for files that match a size you specify in MB. When searching for files larger than 1 GB, you might be tempted to type 1000 so as to avoid reaching for the mouse to change the unit from MB to GB. Actually, there is a much easier way. In HoudahSpot, you can choose between hundreds of criteria to search for files. HoudahSpot also lets you specify in which folders to search and how to sort results. Lots of options to choose from – and settings you don’t want to make over and again. Search criteria, results display, and sort order are a matter of personal preference and habits. You may, for example, find yourself frequently searching for files by file name extension. You may prefer to search your full hard drive rather than just your home folder. You may want search results to always list file size. Let’s see how you can set up HoudahSpot so that a fresh search window matches your preferred way of searching. What Search Criteria are Available in HoudahSpot? Continue reading What Search Criteria are Available in HoudahSpot? DEVONthink is a smart document management solution for Mac. It lets you organize and work with all your documents — bookmarks, email messages, text files, images, PDFs — in one place, regardless where they come from. Now that you have all your documents stored and organized in DEVONthink, you can rely on both DEVONthink and HoudahSpot to always find the piece of information you need. Scanning paper documents to PDF files lets you archive important (and not so important) documents without filling up cabinets. Optical Character Recognition (OCR) makes these scanned documents much more useful than their paper originals. Once a scan has been processed by OCR, the PDF file contains both an image of the document and an invisible text version. The text can then be searched using HoudahSpot. Unfortunately, you will find that not all of your PDF files have text content. You may have forgotten to run them through OCR. Or you may have received the scanned document from someone else. How can you find these files and rectify this? With a little trick, HoudahSpot can find PDF files that lack text content. It is safe to assume that any text contains either a space or a period. Thus, we will be looking for any PDF file that contains neither space or period. MacOS file metadata holds many useful and diverse file facts. This is not limited to file size, extension or creation date. Depending on the type and the application that created it, there is a whole lot of information available on a file’s properties. For e-mail messages, this can be sender name, e-mail subject and attachment type. Or duration, bit rate and musical genre for audio files. In photos, you can even find information on camera model, f-stop number and exposure time. This metadata is useful when organizing files by specific criteria or searching for files with certain properties. E.g. images with a resolution higher than 72 dpi, audios shorter than thirty seconds, or e-mail messages containing PDF attachments. But what metadata is available for a specific file type? How is it labeled? And what kind of information does it contain? HoudahSpot can help you find out. Services are available system-wide. Just choose Services from any application’s main menu or from the context menu. Assigning a keyboard shortcut to a Service makes access even faster. The default search form in HoudahSpot lets you to search for files by name, text content and content kind. When you know the type of the file you are looking for, you may want to search by file extension. Do you frequently search by file extension? Wouldn’t it be convenient if the “File Extension” search was available by default? HoudahSpot searches always go into subfolders. For example, when you search in your home folder, you can find letters saved to your Documents folder. When you don’t want files from a subfolder to clutter search results, excluding the subfolder is easy: just drag the folder from the breadcrumb path at the bottom of the HoudahSpot window to the Locations/Exclude list. You can repeat the procedure to exclude more folders. But if you want to see only results from the top level folder, it is easier to use the path filter to simply hide results from nested folders.